This wonderful album is the result of almost three years of all volunteer effort to make a very special collection of great children's music. 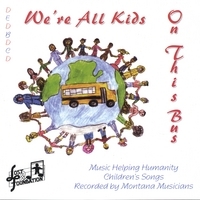 The songs are all original compositions by Montana musicians, that are fun and entertaining to listen to, not just by children, but by 'kids' of all ages! We started in the summer of 1996 as a collaborative project with Mike Leidle of Valtron Studios. The idea was to produce an album of all original music to raise funds for children in need. We sent out 4000 flyers all over Montana, made Public Service Announcements on the radio and obtained newspaper coverage throughout the state inviting musicians to submit their songs. We received over forty submissions, and began a challenging selection process using a structured criteria and a panel of experts, (us and a group of children!). From these we selected the twenty two original songs that make up the album. We brought the musicians to Valtron Studios in Helena, Montana, and spent many months singing, playing, producing, recording, mixing and mastering. The result is this very special collection of great songs, all original compositions, that are fun and entertaining to listen to, not just by children, but by 'kids' of all ages! Lost & Foundation has raised over $15,000 from sales of the album. All proceeds have either been given to the needs of children requiring medical help or has been placed in money market investments to continue helping kids in need. This is a great CD for the whole family! I bought this CD for my niece and nephew when it was first released to support the Lost and Foundation, which does incredible work for families in need. They loved it and we had several vacations together in which we had to play their favorite songs over and over. "There's a Jungle in My Bedroom," "Everybody Cries Sometimes," and "The Quarter Horse" are some of their favorites. I also recently purchased a copy for my young daughter and she also loves the songs, especially the ones which have children singing. Mom's favorite song is "One in a Million Child." We can't wait for the follow-up CD!